Packed In A Trunk in Winston-Salem at Out@The Movies Fest 2015! We are delighted to announce that PACKED IN A TRUNK was awarded the Jury Prize for Best Documentary by Out@The Movies Fest 2015! Big THANK YOU's to Rex Welton and his team and to all the wonderful, generous people we met in Winston-Salem this weekend! Here's to being seen! Edith Lake Wilkinson, Packed In A Trunk and Danielle Ate The Sandwich in Winston-Salem, North Carolina! THE ART! 17 pieces of Edith Lake Wilkinson’s artwork are being exhibited at Salem College in the Elberson Fine Arts Center, Mary Davis Holt Gallery. The show runs from October 23 – November 18th. We can’t wait to see the exhibit ourselves while we're in town! THE FILM! We are thrilled to be joining audiences of OUT@THE MOVIES FILM FESTIVAL for a screening of PACKED IN A TRUNK on Saturday November 14th at 7pm at Salem College in the Hanes Auditorium (in Elberson Fine Arts Center). THE MUSIC! Sunday November 15th at 6pm, the amazingly talented Danielle Ate the Sandwic (Packed In A Trunk’s composer) has a concert at West End Café (926 W. 4th Street) Tickets are $10, all ages welcome. PACKED IN A TRUNK is an official selection of SEATTLE Lesbian & Gay Film Festival and will screen on Monday October 12th at 5:00pm at Northwest Film Forum. We're excited to announce that PACKED IN A TRUNK will be screening as part of OUT@The Movies Fest in Winston-Salem, North Carolina. The screening will take place on Saturday November 14th at 7pm at Salem College. The weekends events will also include an exhibition of several pieces of Edith Lake Wilkinson's artwork and a concert featuring our composer, Danielle Ate the Sandwich. More details to follow soon! Packed In A Trunk: The Lost Art of Edith Lake Wilkinson will make it's US Broadcast premiere on HBO on Monday July 20th at 9pm. The film will be shown several times during the next few weeks (check your local listings) and will continue to air as scheduled by HBO over the next several months. DANIELLE ATE THE SANDWICH at Provincetown Public Library, Saturday June 20th at 4:30pm. Danielle will be performing songs from the film (as well as others from her many albums) and the concert will feature Danielle's usual magical blend of heart, humor and the unexpected. Tell your friends!!! PACKED IN A TRUNK in Denver! PACKED IN A TRUNK in Atlanta! Packed In A Trunk was invited to screen in Atlanta on Feb 5 as part of aTVFest 2015 at the SCAD Atlanta Digital Media Center. PACKED IN A TRUNK among PSIFF 2015 "Best of The Fest"
We were honored to be selected as one of PSIFF 2015's "Best of The Fest" which garnered us an additional screening on the last day of the festival. Thank you Palm Springs International Film Festival! PACKED IN A TRUNK in The Hollywood Reporter! Our first review! Click link for FULL REVIEW! Tickets go on sale this Friday (12/26) for the World Premiere screening of PACKED IN A TRUNK: The Lost Art of Edith Lake Wilkinson at The Palm Springs International Film Festival on January 2nd, 2015 at 7:30pm. We'd love for you to join us! Go to psfilmfest.org for more details. PACKED IN A TRUNK- World Premiere at PSIFF! We’re thrilled to announce that our documentary PACKED IN A TRUNK: The Lost Art of Edith Lake Wilkinson will have its world premiere at The Palm Springs International Film Festival. The film has been selected to screen on opening night of the festival, Friday January 2nd, 2015 at 7:30pm. We will post a link with more details and ticket information as soon as it becomes available. 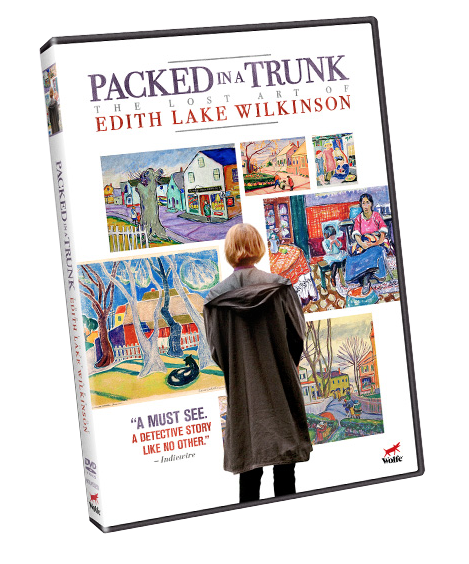 PACKED IN A TRUNK: THE LOST ART OF EDITH LAKE WILKINSON | ©2017 Greenie Films and Little Mama, Inc.